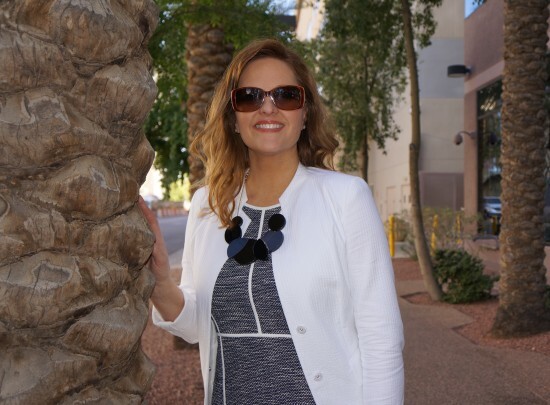 Spring has sprung in Arizona and one of my go-to color combos as we transition into warmer weather is classic white and navy. A white blazer always looks fresh and crisp, especially when paired with a spring tweed sheath dress. (Thank goodness the days of “no white until Memorial Day” are long gone and it looks chic year-round!) This outfit is ideal for work or a special occasion, from weddings and showers to Easter and Mother’s Day. Not to mention it’s super versatile. I’ll be pairing the jacket separately with everything from jeans to skirts, and the sheath is fabulous all on its own. I added a geometric statement necklace, blush pink (color of the year!) mini-satchel, and embellished flats to complete the ensemble. I feel all dressed up and yet comfortable at the same time. A big thank you to Lafayette 148 New York for sponsoring this post! This look is from the brand’s gorgeous Spring 2016 Collection, available now online and in stores. I LOVE this look!! So classic and elegant. This dress! And the shoes!